Not to be confused with Calender, Colander, or Callander. This article is about the dating system. For the physical object, see Calendar (stationery). For other uses, see Calendar (disambiguation). The term calendar is taken from calendae, the term for the first day of the month in the Roman calendar, related to the verb calare "to call out", referring to the "calling" of the new moon when it was first seen. Latin calendarium meant "account book, register" (as accounts were settled and debts were collected on the calends of each month). The Latin term was adopted in Old French as calendier and from there in Middle English as calender by the 13th century (the spelling calendar is early modern). A calendar can be on paper or electronic device. 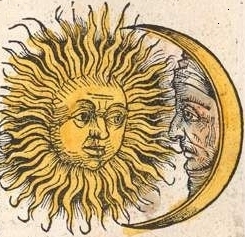 The course of the sun and the moon are the most salient natural, regularly recurring events useful for timekeeping, thus in pre-modern societies worldwide lunation and the year were most commonly used as time units. Nevertheless, the Roman calendar contained remnants of a very ancient pre-Etruscan 10-month solar year. The first recorded physical calendars, dependent on the development of writing in the Ancient Near East, are the Bronze Age Egyptian and Sumerian calendars. A great number of Hellenic calendars developed in Classical Greece, and in the Hellenistic period gave rise to both the ancient Roman calendar and to various Hindu calendars. Calendars in antiquity were lunisolar, depending on the introduction of intercalary months to align the solar and the lunar years. This was mostly based on observation, but there may have been early attempts to model the pattern of intercalation algorithmically, as evidenced in the fragmentary 2nd-century Coligny calendar. The Roman calendar was reformed by Julius Caesar in 45 BC. The Julian calendar was no longer dependent on the observation of the new moon but simply followed an algorithm of introducing a leap day every four years. This created a dissociation of the calendar month from the lunation. The Islamic calendar is based on the prohibition of intercalation (nasi') by Muhammad, in Islamic tradition dated to a sermon held on 9 Dhu al-Hijjah AH 10 (Julian date: 6 March 632). This resulted in an observation-based lunar calendar that shifts relative to the seasons of the solar year. Not all calendars use the solar year as a unit. A lunar calendar is one in which days are numbered within each lunar phase cycle. Because the length of the lunar month is not an even fraction of the length of the tropical year, a purely lunar calendar quickly drifts against the seasons, which do not vary much near the equator. It does, however, stay constant with respect to other phenomena, notably tides. An example is the Islamic calendar. Alexander Marshack, in a controversial reading, believed that marks on a bone baton (c. 25,000 BC) represented a lunar calendar. Other marked bones may also represent lunar calendars. Similarly, Michael Rappenglueck believes that marks on a 15,000-year-old cave painting represent a lunar calendar. Nearly all calendar systems group consecutive days into "months" and also into "years". In a solar calendar a year approximates Earth's tropical year (that is, the time it takes for a complete cycle of seasons), traditionally used to facilitate the planning of agricultural activities. In a lunar calendar, the month approximates the cycle of the moon phase. Consecutive days may be grouped into other periods such as the week. Because the number of days in the tropical year is not a whole number, a solar calendar must have a different number of days in different years. This may be handled, for example, by adding an extra day in leap years. The same applies to months in a lunar calendar and also the number of months in a year in a lunisolar calendar. This is generally known as intercalation. Even if a calendar is solar, but not lunar, the year cannot be divided entirely into months that never vary in length. Cultures may define other units of time, such as the week, for the purpose of scheduling regular activities that do not easily coincide with months or years. Many cultures use different baselines for their calendars' starting years. For example, the year in Japan is based on the reign of the current emperor: 2006 was Year 18 of the Emperor Akihito. An astronomical calendar is based on ongoing observation; examples are the religious Islamic calendar and the old religious Jewish calendar in the time of the Second Temple. Such a calendar is also referred to as an observation-based calendar. The advantage of such a calendar is that it is perfectly and perpetually accurate. The disadvantage is that working out when a particular date would occur is difficult. Calendars may be either complete or incomplete. Complete calendars provide a way of naming each consecutive day, while incomplete calendars do not. The early Roman calendar, which had no way of designating the days of the winter months other than to lump them together as "winter", is an example of an incomplete calendar, while the Gregorian calendar is an example of a complete calendar. The primary practical use of a calendar is to identify days: to be informed about or to agree on a future event and to record an event that has happened. Days may be significant for agricultural, civil, religious or social reasons. For example, a calendar provides a way to determine when to start planting or harvesting, which days are religious or civil holidays, which days mark the beginning and end of business accounting periods, and which days have legal significance, such as the day taxes are due or a contract expires. Also a calendar may, by identifying a day, provide other useful information about the day such as its season. Calendars are also used to help people manage their personal schedules, time and activities, particularly when individuals have numerous work, school, and family commitments. People frequently use multiple systems, and may keep both a business and family calendar to help prevent them from overcommitting their time. Calendars are also used as part of a complete timekeeping system: date and time of day together specify a moment in time. In the modern world, timekeepers can show time, date and weekday. Some may also show lunar phase. The calendar epoch used by the Gregorian calendar is inherited from the medieval convention established by Dionysius Exiguus and associated with the Julian calendar. The year number is variously given as AD (for Anno Domini) or CE (for Common Era or, indeed, Christian Era). The most important use of pre-modern calendars is keeping track of the liturgical year and the observation of religious feast days. While the Gregorian calendar is itself historically motivated in relation to the calculation of the Easter date, it is now in worldwide secular use as the de facto standard. Alongside the use of the Gregorian calendar for secular matters, there remain a number of calendars in use for religious purposes. Eastern Christians, including the Orthodox Church, use the Julian calendar. The Islamic calendar or Hijri calendar, is a lunar calendar consisting of 12 lunar months in a year of 354 or 355 days. It is used to date events in most of the Muslim countries (concurrently with the Gregorian calendar), and used by Muslims everywhere to determine the proper day on which to celebrate Islamic holy days and festivals. Its epoch is the Hijra (corresponding to AD 622) With an annual drift of 11 or 12 days, the seasonal relation is repeated approximately each 33 Islamic years. Various Hindu calendars remain in use in the Indian subcontinent, including the Nepali calendar, Bengali calendar, Malayalam calendar, Tamil calendar, Vikrama Samvat used in Northern India, and Shalivahana calendar in the Deccan states. The Buddhist calendar and the traditional lunisolar calendars of Cambodia, Laos, Myanmar, Sri Lanka and Thailand are also based on an older version of the Hindu calendar. Most of the Hindu calendars are inherited from a system first enunciated in Vedanga Jyotisha of Lagadha, standardized in the Sūrya Siddhānta and subsequently reformed by astronomers such as Āryabhaṭa (AD 499), Varāhamihira (6th century) and Bhāskara II (12th century). 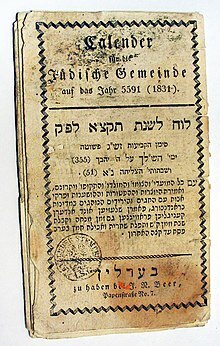 The Hebrew calendar is used by Jews worldwide for religious and cultural affairs, also influences civil matters in Israel (such as national holidays) and can be used there for business dealings (such as for the dating of cheques). Bahá'ís worldwide use the Bahá'í calendar.The Baha'i Calendar, also known as the Badi Calendar was first established by the Bab in the Kitab-i-Asma. The Baha'i Calendar is also purely a solar calendar and comprises 19 months each having nineteen days. The Chinese, Hebrew, Hindu, and Julian calendars are widely used for religious and social purposes. The Iranian (Persian) calendar is used in Iran and some parts of Afghanistan. The Ethiopian calendar or Ethiopic calendar is the principal calendar used in Ethiopia and Eritrea, with the Oromo calendar also in use in some areas. In neighboring Somalia, the Somali calendar co-exists alongside the Gregorian and Islamic calendars. In Thailand, where the Thai solar calendar is used, the months and days have adopted the western standard, although the years are still based on the traditional Buddhist calendar. A fiscal calendar generally means the accounting year of a government or a business. It is used for budgeting, keeping accounts and taxation. It is a set of 12 months that may start at any date in a year. The US government's fiscal year starts on 1 October and ends on 30 September. The government of India's fiscal year starts on 1 April and ends on 31 March. Small traditional businesses in India start the fiscal year on Diwali festival and end the day before the next year's Diwali festival. In accounting (and particularly accounting software), a fiscal calendar (such as a 4/4/5 calendar) fixes each month at a specific number of weeks to facilitate comparisons from month to month and year to year. January always has exactly 4 weeks (Sunday through Saturday), February has 4 weeks, March has 5 weeks, etc. Note that this calendar will normally need to add a 53rd week to every 5th or 6th year, which might be added to December or might not be, depending on how the organization uses those dates. There exists an international standard way to do this (the ISO week). The ISO week starts on a Monday, and ends on a Sunday. Week 1 is always the week that contains 4 January in the Gregorian calendar. In the US Sunday is considered the first day of the week and so appears on the far left and Saturday the last day of the week appearing on the far right. In Britain the weekend may appear at the end of the week so the first day is Monday and the last day is Sunday. 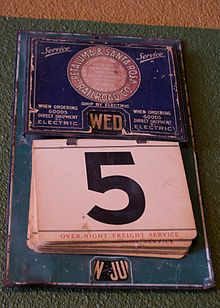 The US calendar display is also used in Britain. It is common to display the Gregorian calendar in separate monthly grids of seven columns (from Monday to Sunday, or Sunday to Saturday depending on which day is considered to start the week – this varies according to country) and five to six rows (or rarely, four rows when the month of February contains 28 days beginning on the first day of the week), with the day of the month numbered in each cell, beginning with 1. The sixth row is sometimes eliminated by marking 23/30 and 24/31 together as necessary. Calendaring software provides users with an electronic version of a calendar, and may additionally provide an appointment book, address book or contact list. Calendaring is a standard feature of many PDAs, EDAs, and smartphones. The software may be a local package designed for individual use (e.g., Lightning extension for Mozilla Thunderbird, Microsoft Outlook without Exchange Server, or Windows Calendar) or may be a networked package that allows for the sharing of information between users (e.g., Mozilla Sunbird, Windows Live Calendar, Google Calendar, or Microsoft Outlook with Exchange Server). Real-Time Clock (RTC), which underlies the Calendar software on modern computers. ^ "Oldest lunar calendar identified". BBC News. 16 October 2000. Retrieved 14 March 2013. Look up calendar in Wiktionary, the free dictionary. "Calendar" . Encyclopedia Americana. 1920. "Calendar" . Encyclopædia Britannica (11th ed.). 1911.